This is my favorite picture frame to date. 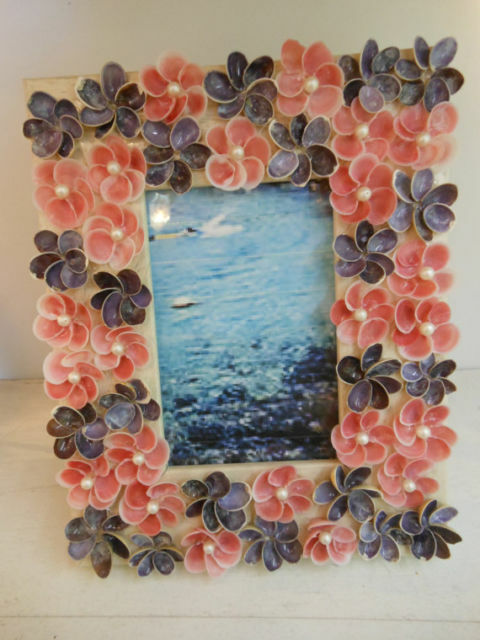 I used pieces of sliced purple cowrie and pink rose cup clams to create flowers covering the entire frame. I completed the flowers by placing white pearls in the center. This is an original Live Coastal design! It will surely brighten up any room in your home. The picture frame itself is a wood frame with a cream colored finish. The picture size is 3 1/2 by 5 1/2. The whole frame size is 7 1/2 by 9 1/2.